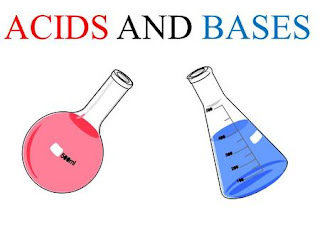 An acid is a substance that tastes sour, reacts with metals and carbonates, and turns blue litmus paper red. An acid is any substance that produces hydrogen ions (H+) in water. It is the hydrogen ions that cause the properties of acids you can see. For instance, when you add certain metals to an acid, hydrogen ions interact with metal atoms. Although sour taste is a characteristic of many acids, it is not what should be used to identify an acid. Acids react with certain metals to produce hydrogen gas. Acids are as corrosive, they "eat away" at other materials. When acids react with carbonate compounds, a gas forms, the gas is carbon dioxide. Indicator, a compound that changes color when in contact with an acid or a base, acids always turn litmus paper red. In solution, acids often look like water, but they react very differently. A concentrated acid can burn a hole in metal, cloth, skin, wood, and other materials. Many of vitamins in the foods you eat are acids. Acids are useful in the body and are also waste products of cell processes. People often use diluted solutions of acids to clean bricks and other surfaces. Hardware stores sell muriatic (hydrochloric) acid, which is used to clean bricks and metals. Farmers and manufacturers depend on acids for many uses. Sulfuric acid is used in car batteries, to refine petroleum, and to treat iron and steel. Nitric acid and phosphoric acid are used to make fertilizers for crops, lawns, and gardens. A base is a substance that tastes bitter, feels slippery, and turns red litmus blue. A base is any substance that produces hydroxide ions (OH-) in water. Hydroxide ions are responsible for the bitter taste and slippery feel of bases. Hydroxide also turn red litmus blue. Strong bases can irritate or burn your skin. Unlike acids, bases don't react with carbonates to produce carbon dioxide. In solutions, bases sometimes look like water, or they may be cloudy white. Some bases cam burn your skin. Baking soda reacts with acids to produce carbon dioxide gas in baked goods. Ammonia solutions are safe to spray with bare hands, but gloves must be worn when working with drain cleaners. Bases such as milk of magnesia (magnesium hydroxide) and calcium carbonate help ease effects of too much stomach acid. Mortar and cement are manufactured using the bases calcium oxide and calcium hydroxide. Gardeners sometimes add calcium oxide to soil to make the soil less acidic for plants. 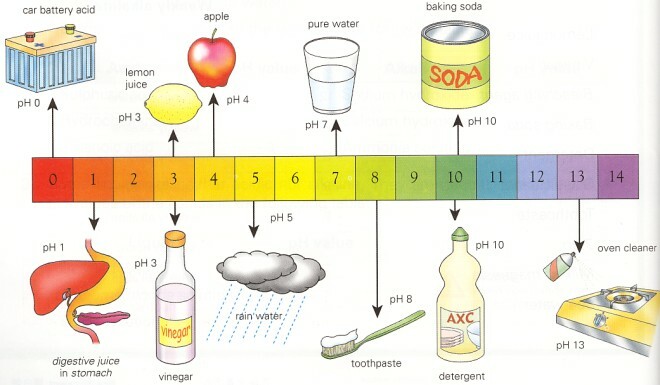 To describe the concentration of ions in a convenient way, chemists use a numeric scale called pH. The pH scale ranges from 0 to 14. It expresses the concentration of hydrogen ions in a solution. When the pH is low, the concentration of hydrogen ions is high. A reaction between an acid and a base is called a neutralization. A salt is any ionic compound that can be made from neutralization of an acid with a base. A salt is made from the positive ion of a base and the negative ion of an acid. One product of the reaction is water. The other product is potassium nitrate (KNO3), a salt. Potassium nitrate is written in the equation as separate K+ and NO3- ions because it is soluble in water. A neutralization reaction produces water and a salt.